Also known as Maiden Veil Fungi. This fungus is characterised by a terrible smell (likened to rotting-meat) which has been known to cause groups to change their campsites. This fungus is not a fly catcher but rather attracts blowflies to crawl through its veil, collecting spores which it spreads through the rainforest. There are different types of stinkhorn shapes  some with horn-like fruiting bodies, some with lacy skirts, and some with nets. They require a substrate with a high organic and moisture content. 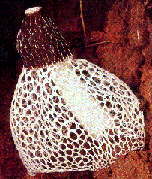 The white phallus-shaped fruit body, about 20cm high, emerges from the ground during the night and spreads its lacy veil that almost immediately attracts the blowflies to it. Another group of familiar fungi are the gasteromycetes, which includes the puffballs and the Phalloids. This last group includes the distinctive 'Stinkhorn fungi' that are often noticed due to their bad smell as they erupt from the ground. If that wasn't bad enough, they are usually very phallic shaped. Some species, such as the bridal veil, having delicate lace like network (below) while others are star-shaped. The smell is produced by a liquid that contains the spores, so when insects such as flies are attracted to the fungus, they end up distributing the spore. The Gasteromycetes include the 'puff-balls'. The fat round structures release their spore through a central top opening or all over the body in puff-like cloud when the skin breaks apart, or when disturbed by a finger or a rain drop.